Moist, light & just the right amount of spice! Are you Team Chocolate Chip or Team Classic? 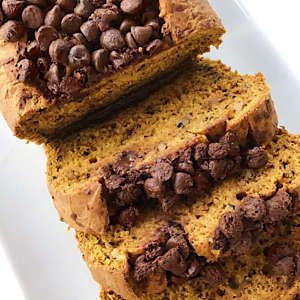 My son likes his pumpkin bread plain; for me, the more chocolate chips the better. Lucky for us, this recipe makes two loaves so we’ll add chocolate chips to the top of just one. It’s the perfect classic pumpkin bread. It’s moist, has a great consistency and just the right flavor- not too sweet, not overly spiced. Made with a family recipe, I substituted GFJules all purpose flour in place of regular flour. It’s super easy, so yummy, and the house smells amazing when you bake it! It's the perfect classic pumpkin bread. It's moist, has a great consistency and just the right flavor- not too sweet, not overly spiced. Can be made with our without nuts, raisins, chocolate chips. In a large bowl, cream butter and sugar until fluffy. Stir in eggs, pumpkin and water. In a separate bowl blend flour, baking soda, salt, baking powder, cinnamon and cloves. Add dry ingredients to wet & mix well. Stir in nuts, raisins and/or chocolate chips if using. Bake 70 minutes or until wooden pick inserted into center comes out clean. IF topping with chocolate chips, I find it best to add the chocolate chips about 15 or 20 minutes into baking. If the chips seem to be burning on top at any point, cover with foil to complete baking.